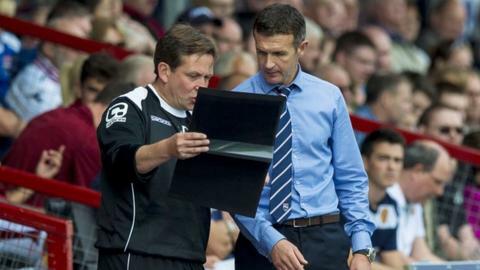 Ross County manager Jim McIntyre talks tactics with assistant Billy Dodds (left). Ross County manager Jim McIntyre has assured fans they will get better after they fell to a 2-1 defeat at home to Motherwell in his first game in charge. Liam Boyce's late goal was not enough after stunning strikes by Iain Vigurs and John Sutton. McIntrye has been in charge of bottom-of-the-table County for just three days and felt that was a factor. "Every man gave their all and that's all we can ask," he told BBC Scotland. "Things will definitely get better." The Dingwall side have yet to pick up a point this season, a run that led to Derek Adams' exit from the club. However, the former Queen of the South boss said he saw enough positives to be confident about a revival. "I thought we started really well," he said. "For 25 minutes, we looked more likely to score. "We had a couple of opportunities that, when you're on top in a game, you've got to take, especially at this level. "In the second half, the goals changed the game. You've got to give credit, it's two great strikes. But we rallied again and we had a real go for the last 15 minutes. "We're disappointed to lose the match, of course we are, but we've been in the door three days. We're disappointed to lose the match, of course we are, but we've been in the door three days. "The boys have tried to take on as much information as what we're trying to put in them and I thought their efforts were excellent. "There's always things to do better and things to tidy up on, but having had three days to work with them, it's a big ask to get them totally the way you want them so that's a work in progress and we'll continue to do that on the training park. "We'll take positives, but we've lost the match."